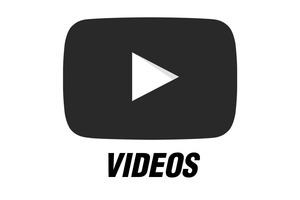 Are you interested in a quote on the Ferti-GO 4S? Please fill out the form below and one of our Territory Managers will be in touch shortly. 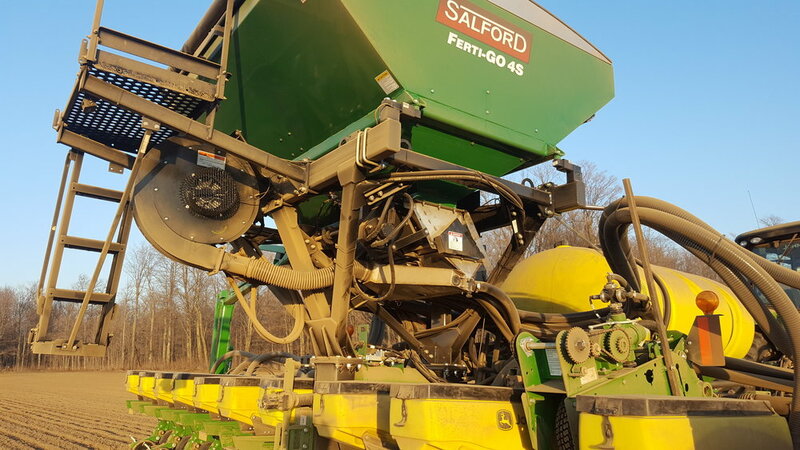 Salford's Ferti-GO 4S, delivers fertilizer on the go! This "Granular On-board" tank holds up to 6 tons of fertilizer* and meters through Salford's proven ST-Series metering system. 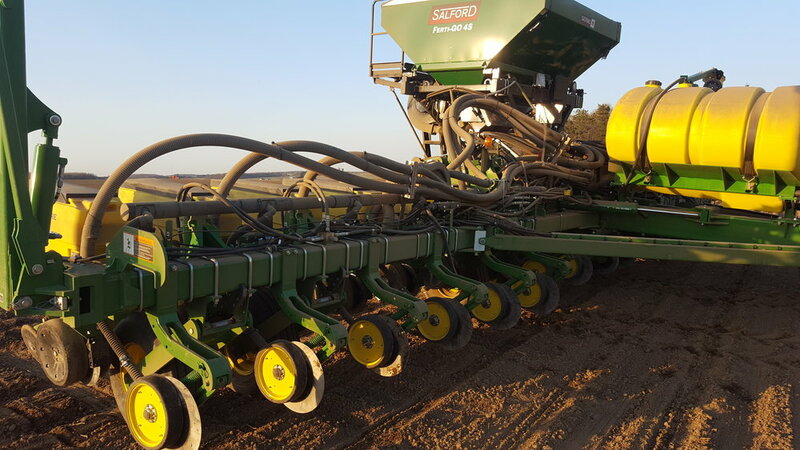 The narrow foot print of the Ferti-GO and the mounting legs are designed for direct mounting on to popular planter models. 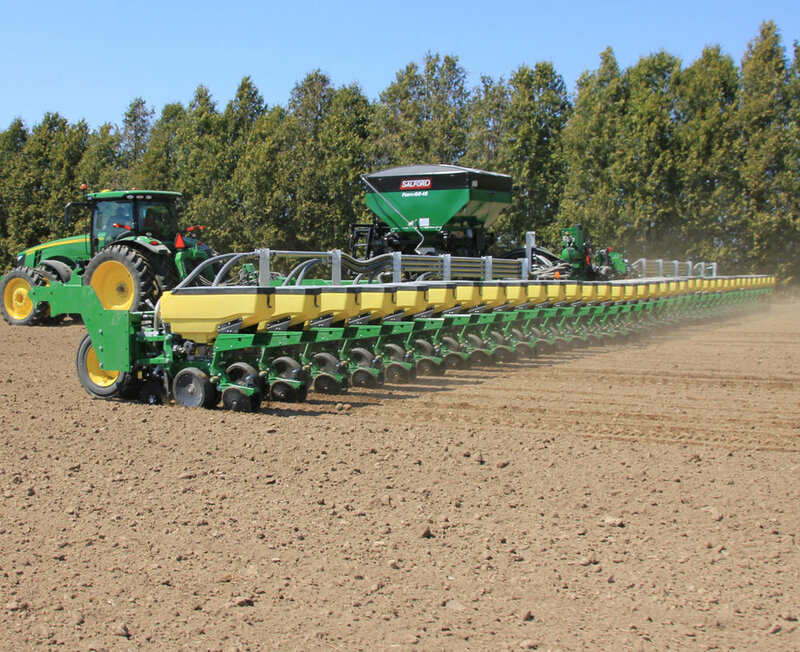 Mounting legs are available for popular planter models that are designed to carry on-board fertilizer systems. Mounting legs are designed to carry optional weigh scales. * Note: 6 ton capacity is optional. 4 ton capacity is standard. Always consult with your planter manufacturer on frame carrying capacities prior to mounting hoppers. The Ferti-GO 4S features a 409 stainless steel single compartment hopper, with a standard capacity of 4 Tons. Optional extensions can raise capacity to 6 Tons*. Standard hopper screens allow product to filter through, while keeping rocks and other materials out of the metering system. Bin level sensors are also standard. A roll tarp acts as the hopper's lid, and is easily rolled open and unrolled for closure, using the standard crank arm. When the roll tarp is rolled open, the top of the hopper offers a large area of access for filling, and makes it easier for tender trucks to reach. A platform and ladder is also standard, for simple and safe hopper access. In order to make the Ferti-GO 4S easy to unload and clean, it utilizes many of the same features of the ST Series, including: snap-in meter rollers, spring loaded hopper gates, and a full width meter box clean-out door below the air manifold. The meter rollers are the same, accurate, peg style rollers used in the ST Series, available in both standard and low rate peg sizes. Meter drive is hydraulic and variable rate ready, with a factory installed PWM valve. The 4 section metering system is the same reliable metering used in the ST Series, with the capability of turning up to 4 sections on or off based on field requirements. The Ferti-GO 4S comes standard as rate control ready, which allows producers to install a third party rate controller of their choice. An optional ISOBUS control system allows connectivity to any ISOBUS compliant cab console. Mechanical engagement of the meters is achieved via electric clutches; a proven approach that has already seen extensive use on other Salford-Valmar products*. 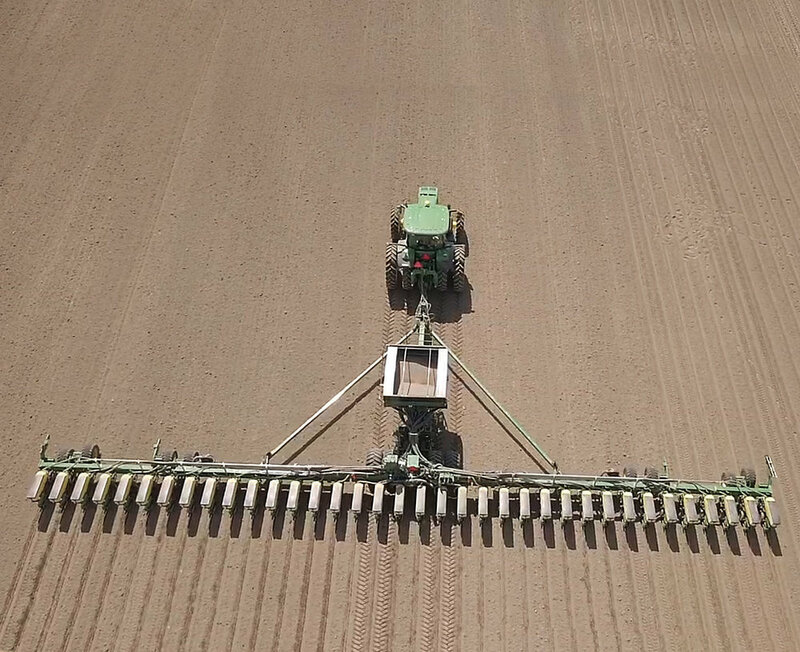 * Note: May not be compatible when used in conjunction with some planter controllers. A 20 inch fan, driven by a 12 cc hydraulic motor, spins at up to 5900 rpm to provide plenty of air at high rates (requires 30 GPM @ 2800 psi). 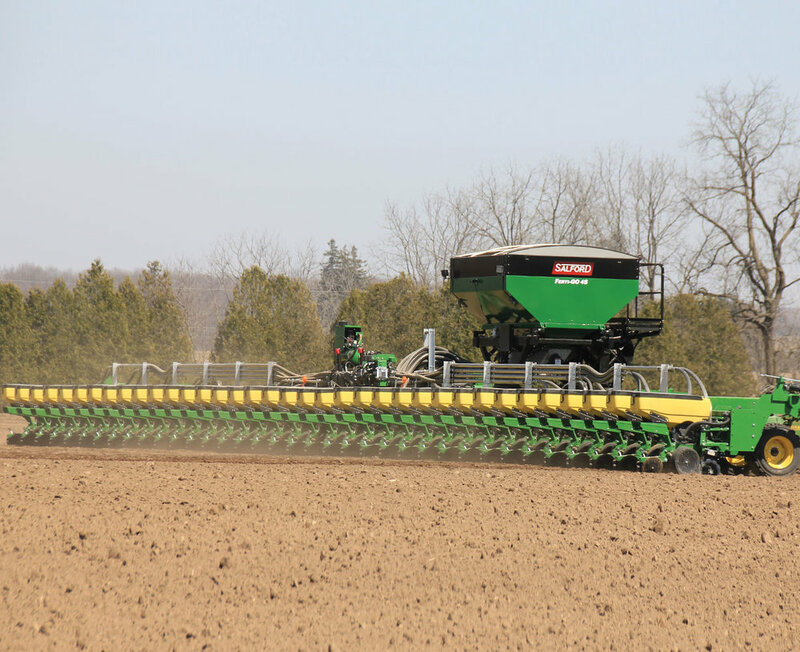 Optional dual fans are available, to provide adequate airflow to high speed or wide swath planters (requires 42 GPM oil flow @ 2800 psi). By maintaining a set pressure in the air plenum behind the Venturi manifold, a constant, reliable airflow can be achieved - regardless of the number of outlets. * Metering output ratings based on as tested conditions – factors such as air temperature, humidity, hydraulic oil temperature, and product can affect output. Please ensure your tractor meets the hydraulic requirements listed.